Same shape and size as Big Paddletail Shallow but with a fixed internal rig for the double trebles that are standard on this bait. 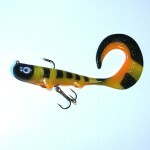 Big Paddletail Sink will help you target those fish that are impossible to reach with a regular or shallow bait. Big Paddletail Sink still has a great tailmovement and will attract fish on the drop as well. 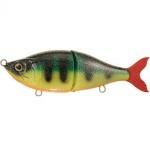 Weighing 130 grams and measuring 20cm long this swimbait can be fished as deep as you want, just let it sink. 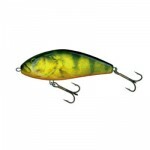 Category: Jeff Boggs, Lure Videos, and Swimbait/Softbait. Tags: Big Paddletail Sink, Jeff Boggs, swimbait, and underwater video.